This section gives you more information about the medicine commonly used by kidney patients. We will also answer some questions about prescriptions. It is important to take your medication according to the instructions on the packet. Please talk to your kidney doctor or nurse at the hospital, or your GP, before you stop taking any medication, even if you have side effects, as stopping suddenly can be harmful. There may be an alternative medication you can take. These are some of the main medications you may be taking. Please ask the healthcare team if you have any questions. for kidney patients are called doxazosin, atenolol, ramipril and irbesartan. Reducing your blood pressure will not make you feel better in the short-term. However, in the long-term, the tablets will help you to stay healthy. Healthy kidneys are very good at producing the right amount of urine to match the fluid you take into your body when you eat and drink. Damaged kidneys are not so good at producing urine and this often means that fluid builds up in your body, causing swollen ankles, difficulty breathing and high blood pressure. Diuretics are tablets which encourage your kidneys to produce more urine, making you go to the toilet more. The most common diuretic is furosemide. When taking diuretics it is important not to drink too much fluid because the medication will be less effective and you will need to take higher doses. There is more information about fluid and diet here. Erythropoietin is often known as EPO. It is a hormone which is produced by healthy kidneys. EPO stimulates the bone marrow to make red blood cells. When your kidneys are not working properly you do not make enough EPO and you become anaemic. You may then feel tired, weak, cold and generally unwell. When your kidneys are not producing enough EPO we can give you artificial EPO injections. Some people have this when they are on dialysis and many are taught how to do it themselves at home. If it is difficult for you to do your own injections, or you do not want to do them, we can arrange for a district nurse to help. Your healthcare team needs to monitor your blood results and blood pressure when you have EPO injections and they may ask your GP to help with this. There are several brands of EPO available, including Mircera®, Aranesp®, Neo-Recormon® and Eprex®. If you have any questions, or want information about EPO and how to inject yourself, please talk to the anaemia nurse. Your body needs iron, folic acid and vitamin B12 to make red blood cells and prevent anaemia. There are many iron supplement tablets available and the most commonly used is called ferrous sulphate. However, people with chronic kidney disease are often unable to absorb iron from their stomach. We prefer to give iron injections directly into a vein because it corrects the iron deficiency straight away. These are mainly given to PD patients to prevent constipation as this can sometimes stop the catheter from draining properly. There are many different types including senna, lactulose and sodium docusate. These help to control your phosphate levels. The medication may be called Calcichew®, Adcal®, Fosrenol®, Renagel® or Phosex®. These need to be taken up to 15 minutes before, or with, food. Reducing your phosphate levels can help to prevent itchiness and bone weakness, and may help reduce your risk of heart problems. These are given to help prevent the build up of acid in your body. As your kidney function decreases there is less acid in your urine causing your bicarbonate level to drop. A low bicarbonate level can be bad for your heart and can hasten the deterioration of your kidney function. You might need statins to lower your blood cholesterol as high cholesterol can lead to heart disease. There are many different types of statins available including simvastatin, pravastatin and atorvastatin. A healthy diet and exercise can also help to lower your cholesterol. This helps control calcium in your body and protects your bones. The medication may be called alfacalcidol. You take this daily or weekly depending on the instructions. When you start dialysis or have a transplant, your medication will change. Your healthcare team will tell you more about this. Why do I have to have a hepatitis B vaccination? All patients with kidney disease who need dialysis are at a slight risk of getting hepatitis B. This is a viral infection spread through infected blood or bodily fluids. It is advisable for all patients with CKD to have hepatitis B vaccination. This is a safe vaccine which is usually given as four injections over six months. It is important that you have all the injections. Ask a kidney doctor or nurse or your GP for more information about the hepatitis B vaccine. Can I take over-the-counter medications? Over the counter (OTC) medications are ones you can buy from a pharmacy/chemist or supermarket without having a prescription from your doctor. It is particularly important to avoid a type of painkiller called a non-steroidal anti-inflammatory drug (also known as NSAID), such as ibuprofen (Nurofen®) as these can cause further kidney damage. Paracetomol is a safer alternative painkiller. Always speak to the pharmacist and explain that you have CKD before buying over-the-counter medications. Please also let them know what medications you are taking so that they can check that they do not interact with any OTC medicines that you may wish to take. Talk to your GP or doctor/nurse at the kidney clinic before you start taking any complimentary medicines or herbal remedies. This is because they can contain unlabelled substances such as potassium or sodium which may be harmful to you. Where do I get a repeat prescription? Your GP will be able to prescribe all your medications. You should ensure you never run out of your prescribed medications. have diabetes mellitus, except where treatment is by diet alone. What is an annualised prescription? Patients with CKD often have to take a lot of medication and this can be very expensive. You could save money by buying a pre-payment certificate. 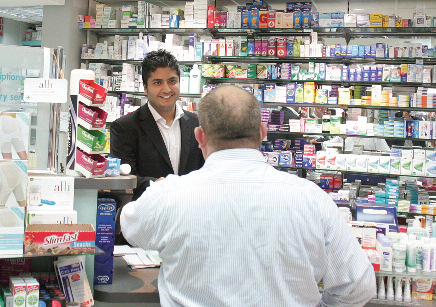 Your local pharmacist can give you more information or visit www.nhsbsa.nhs.uk. Bring all your medications, or a list of them, to every hospital appointment. Take all your medications, or a list of them, if you are going to see your local pharmacist or your GP. Do not stop taking your medications without talking to your GP, kidney doctor or nurse. If you are given a one-off course of medication, finish the course. Have all your prescribed Hepatitis B injections – ask the nurse if you are not sure.